In the ancient Sumerian story, each Spring, Geshtin-anna returns to the underworld to free her brother. Each Autumn she returns on Earth to harvest the grapes and make wine, and her brother goes back to the underworld. In ancient art, she is usually depicted with a goat. 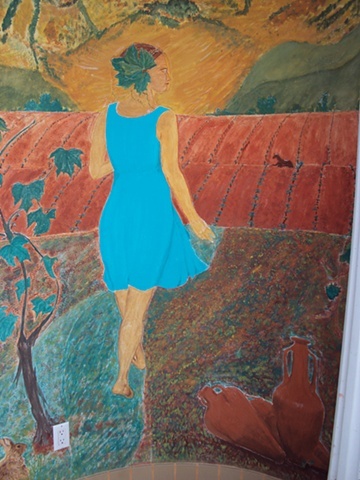 In this mural, the goat awaits her in the distant hills, reminding her it is time to go. When I painted her face, it was rather haunting. Although I had drawn her to look sad, when I painted her face, she emerged with more of a death sentence appearance. This, until she rises again. I added a rabbit to the mural, although not traditionally referred to in the story. I like rabbits, and they are good luck. Somehow, the painting just needed that rabbit. Please see the next image for its detail. Sinior Marmina was the master mason for both of these murals. Both of the Geshtin-anna murals' walls are concave, which made it more challenging.